The other day I tried to take a photo of the moon, which was bright orange. That photo really did not turn out too well. But as I was walking back I shot this one with the moon behind some tree limbs, which seemed to work. Thank you for sharing your picture with me. I am reminded of a quote I once heard, but cannot remember who said it, but would be happy to share it with you. "Sometimes, while looking at the moon,the clouds will come to bring you rest." We need to get past the twigs and branches that block our path in life, and see the beauty that lies ahead. And you know, sometimes we don’t recognize the beauty as much as we should until the sight is blocked. 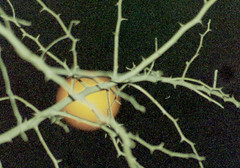 I couldn't get a good shot of the moon until the twigs were in front.